The Lost boys are the republicans in Washington and the Natives are the democrats. A game is played within the beltway in which they both take turns ‘winning” on a variety of issues or spending packages but at the end of the day they know they are just playing a game. The Democrats launch a spending spree beginning in 2008 that was unseen at anytime in US history and their opponents railed repeatedly against it but they were defeated by the democrats in this round. In 2010 and 2014 the Republicans surged into huge majorities in congress and for the first time in decades controlled both houses, yet a 1.4 trillion dollar spending bill and an increase in the debt limit was passed anyway. Just like the lost boys and the Natives take turns fighting, the politicians have taken turns winning these little battles within the beltway. 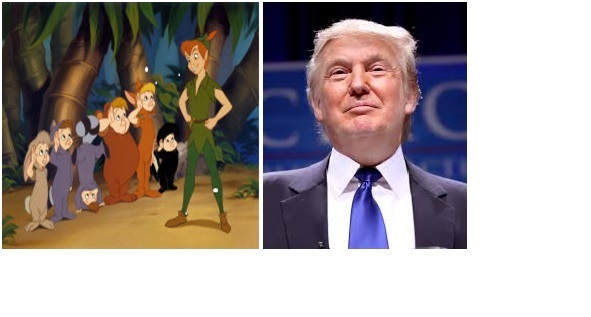 Meanwhile their leader, Peter Pan, is having a grand ol’ time with the status quo. 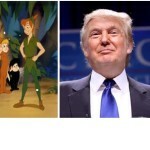 So if Republicans are the lost boys and Democrats are the Natives, who is playing Peter Pan? In our opinion Goldman Sachs is the boy that never wants to grow up. Leave everything the same, change nothing and everything will be fine. Interest rates have been at artificially low levels since 2008 yet month after month we are told the economy is improving, the job market is hot and everything is solved. The slightest hint of a change in fed policy the last three years has resulted in a stock market meltdown until the fed has to come out and pat “Peter-Sachs-Pan” on the head and assure him that they can continue borrowing money a .025% from the fed window. Donald Trump however is upsetting this perfect relationship and it has the establishment on both sides getting very nervous. Unlike Obama, Romney, McCain, Hillary and others, Trump doesn’t need Goldman Sach’s money nor their former CEO’s or Executives to be in his potential cabinet or serve as Treasury Secretary. Heck, Trump would probably laugh at the idea of a Goldman Sachs big wig wanting to run the currency in this country when they nearly bankrupted the entire banking system a few years ago. For the first time they do not own the politician like they did in years past and the establishment has taken to their pals in the press to try and put undue pressure on Trump to apologize for everything and anything, yet he refuses and why? He doesn’t have to. Previously, candidates would cry and apologize for anything that was said or misconstrued or deemed inappropriate because the establishment Political Action Committees (Funded by Wall Street) would threaten to cut them off. Trump doesn’t need these PACs nor their money and they are literally in a panic. The Press in particular is in a state of sheer panic about Trump. From ABC to Fox news they seem to be confounded by not only his lack of apologies and political correctness but also his rise in the polls. In the summer, nearly every political pundit was laughing about Trump and predicting he would be out of the race by December. Don’t look now, but there are only 2 days left in December and Trumps numbers are higher nationally than they were in the summer. The Democrats and Republicans play this spending game in which they both get what they want. The Democrats will rail against cutting 500 million from Planned Parenthood and any spending cut to welfare. This will keep their constituents on the socially liberal side happy that they are fighting the good fight for them. The republicans generally rail against all spending so they can appear to be fiscally conservative for the months leading up to a possible close down and then they get some sort of deal done wherein 50 million is cut from the federal debt over the course of 190 years and then they hawk to their conservative constituents how spending was cut. Need evidence of the staged battles between the lost boys and natives? Paul Ryan proposed the “Path to Prosperity’ in 2012 which he would balance the budget in 10 years but it was blocked by the Democrats in the Senate who had the majority. Now that Ryan is speaker of the house and republicans control the Senate, did Ryan reintroduce this bill now that it was ‘their turn to win”? No. Despite having the ability to put this before the President and force him to explain to Americans why we can’t have a balanced budget, he punted for fear of upsetting the establishment. There is a genuine fear factor regarding Trumps rise among the establishment in America that has not been seen since perhaps Ronald Reagan’s rise in the late 70’s. For Democrats and Republicans, the party will come to an end if they have to submit a real spending bill that doesn’t have all their prized pork inside at tax payers’ expense. The real fear wouldn’t just be a President Trump rejecting the spending bill, but a President who might call out individual spending pork by city and representative.. Trump would use the bully pulpit to call out the ridiculous spending from both parties on everything from funding Foreign students to study here in America to $300.00 toilet seats for the Navy. Contracts that were favorable in a representative’s district may suddenly come under scrutiny instead of being swept under the rug by a larger bill. The Liberal dominated press is absolutely terrified by a Trump candidacy but not because of his stance on Illegal immigration or Muslims entering the country. This is a mere smoke screens designed to whip up a socially liberal base and try to put pressure on Trump. The press has been pushing its social agenda for many years and under the current president, they have made leaps and bounds to push this agenda. They are generally afraid that a Trump Presidency will reverse 2 decades of perceived sensitivity training and political correctness. The unwritten restrictions on Freedom of speech may suddenly be at peril if the President is out there giving speeches and calling things the way he sees them instead of worrying about offending somebody. The War on Police in the press would also come to a screeching halt if Trump was elected. Instead of a President telling Americans that the police may have acted stupidly, what might Trump’s message be? Truthfully, we don’t know but when you see The Liberal Press and Republicans and Democrats working hand in hand to discredit this candidate, one has to always follow the money and in this case, it appears for the first time all the Wall Street money and influence that usually decides elections has been denied entrance into Never Never Land.